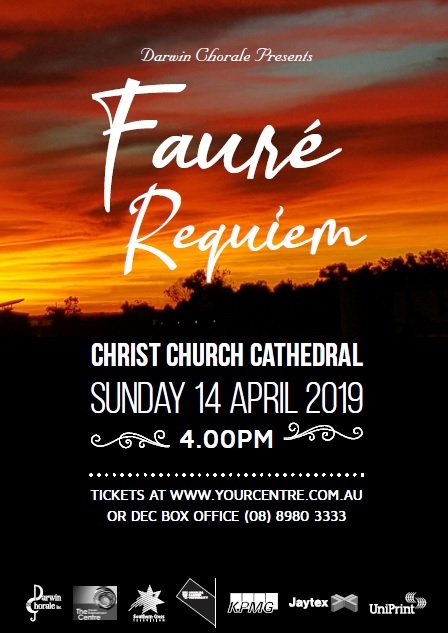 The words lofty, sublime and death do not normally go hand in hand, but in Darwin Chorale’s forthcoming concert, Fauré Requiem, those themes are seamlessly bridged. For composter Gabriel Fauré, death is likened to going to sleep and his outlook is therefore introverted and lullaby-like. The traditional Catholic mass is caressed in a way that the listener is soothed by what Fauré called the ‘very human feeling of faith in eternal rest’. Under the music direction of Digby Barrow, the seven movements of the choral-orchestral work will be performed on Palm Sunday (April 14) in the lead up the Easter period. Darwin Chorale will also perform JS Bach’s treatment of Jesu, meine Freude, a 17th century hymn that personifies Jesus as joy and support, versus enemies and the vanity of existence. These stark contrasts are illustrated by the vivid choral melody with an uncommonly wide vocal range. Christ Church Cathedral will provide a fitting backdrop to the performance, with acoustics that will highlight Darwin Chorale’s strengths as the top end’s premier choir. As with last year’s Easter Sunday sell-out performance of Gloria!, Fauré Requiem will also prove popular to Christians and music lovers alike. Tickets available online or at the door – unless sold out prior!